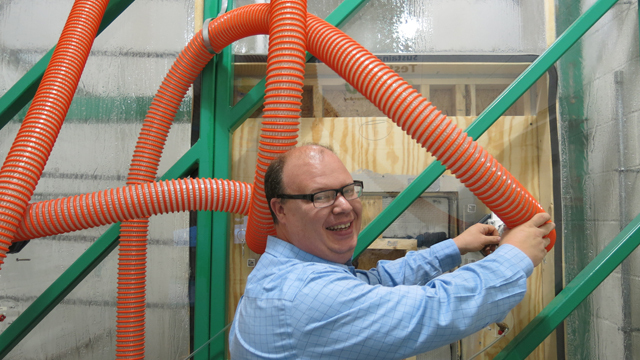 Tremco's Tim Mattox tests how well a silicone sheet seals off a typical window gap at their test facility. Cleveland, like many cities, has a fleet of old, drafty buildings. These buildings are energy hogs and account for close to half of the nation’s overall greenhouse gas emissions. President Obama highlighted the building sector recently, announcing $2 billion in energy upgrades to federal buildings, and many in the environmental community say we should be focusing on improving building performance across the board. Tremco’s chamber simulates stormy conditions to test whether building elements have a tight, waterproof seal. To get a sense of how and why one might want to retrofit an older building, I climbed inside a local company’s test chamber. On the day I visited Tremco’s Sustainable Building Solutions Test Facility in Cleveland, Ohio, it was drizzling outside, but inside there was a full-on rainstorm. Here at Tremco they focus on improving the skin of a building — that is, its walls, windows, glazing, and basically everything that protects a building from, say, a rainstorm. “A typical home in the U.S. today averages about a 15-square-foot hole,” said Mattox. With a couple keystrokes, Tremco Manager Tim Mattox started simulating a heavy storm in their test chamber. The see-through chamber is skinny but tall, stretching up nearly to the ceiling of the warehouse. I can see sprinklers inside the chamber shooting water from every direction. Getting pummeled by this rainstorm is a test wall. 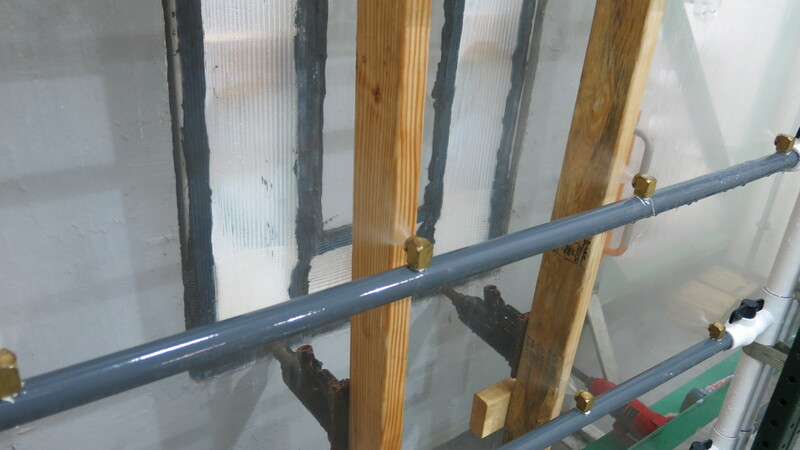 They’re testing the ability of one of their silicone sheet products to provide a watertight seal on a typical building gap, like one you might see around the edges of a window frame. Window gaps, like this one, can be a major source of air and water leakage. Buildings actually have a surprisingly large number of gaps, small stuff usually, but it really adds up. “A typical home in the U.S. today averages about a 15-square-foot hole in the inside of the house just because when you take the collective openings that are available to seal on any given home out there, that’s about what you’re getting — a 15-foot hole,” said Mattox. 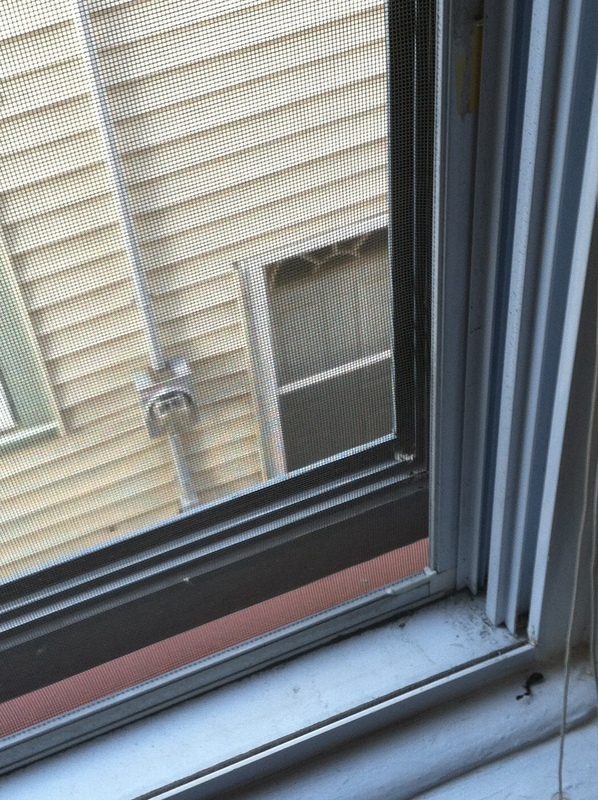 If you don’t seal off building gaps, moisture can get in, cause mold growth, and rot your walls. A silicone sheet like the one getting drenched in the test chamber also prevents air from leaking out. Stopping air leaks is key to reducing a building’s overall energy use. Mattox eventually cuts the jets and prepares to simulate windy conditions and measure the movement of air through this silicone-sealed building gap. Bright-orange tubing feeds into the chamber like a scene out of The Matrix. “It’s running right now, so he’s pulling a vacuum, so you can sort of see the silicone sheet start to pull in,” said Mattox. Digital monitors show this gap is well sealed. The sheet’s doing its job and keeping air and water out of the simulated building gap. “Spiders have a tendency to build their webs in areas where there is a draft,” said Mattox. Tremco works mainly with commercial properties, but homeowners can benefit from a gap inspection as well, whether you do it yourself or call in a professional. Gaps can be found anywhere in a building, especially at joints where one material or part meets another. Mattox’s advice is to start with the low-hanging fruit: your doors and windows. Swap out old weather stripping, apply an exterior sealant around your windows, maybe stuff some “flex foam” in there, too. Basically find any crack or crevice and seal it off. And for a party trick, said Mattox, keep an eye out for spider webs. “Spiders have a tendency to build their webs in areas where there is a draft,” he said. Doing this will go a long way toward greater energy efficiency and could save you a wad of cash. “Any time it rolls through a duct, you’re investing money into that air, and if you’re not containing that or controlling that airflow, you are throwing money literally out the window,” said Mattox. “It’s a big deal…It’s not just an energy issue, that can be a resiliency issue,” said Kerr. Laurie Kerr is the director of the City Energy Project, an initiative of the Natural Resources Defense Council and the Institute for Market Transformation. She says we don’t hear a lot about buildings, but in fact, nationally they’re responsible for about 40 percent of our carbon emissions. “It’s a big deal…It’s not just an energy issue, that can be a resiliency issue. So if something happened, a big storm and it knocked out the electricity for the area, a building that has really good insulation and isn’t leaking is going to maintain its habitability a lot longer than one that doesn’t have a good building envelope, which is the wrapping of the building,” said Kerr. Kerr says old buildings need checkups, just as people do when they’re under the weather. Calling in some house doctors — a professional energy audit — can be a good way to think through your options, such as sealants, roof insulation, lighting changes, and window and HVAC upgrades. An audit will give you a sense of what options would deliver the best return on investment. Just like people, each older building is unique, and most could benefit from a performance boost. Doesn’t sealing building air gaps lead to so-called “Sick Building Syndrome” ? I understand your reasoning in seeking efficiency, but what about air quality inside?